The field house at Holy Family Catholic High School in Victoria received a rock concert-style makeover on Saturday, Sept. 21, including a giant stage, spotlights, sound boards, projection screens, and at least one smoke machine. Complementing the awesome transformation was a full slate of speakers, performers and participants focused on one thing during the seven-hour celebration: Jesus Christ. 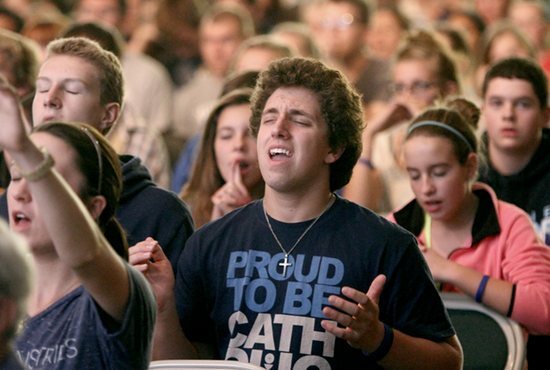 About 1,600 high school-aged Catholics from across the Archdiocese of St. Paul and Minneapolis gathered to celebrate Jesus and the life of the Church at the second annual Archdiocesan Youth Day. Hosted by Archbishop John Nienstedt, the event encouraged the youth to be faithful living witnesses of Christ. 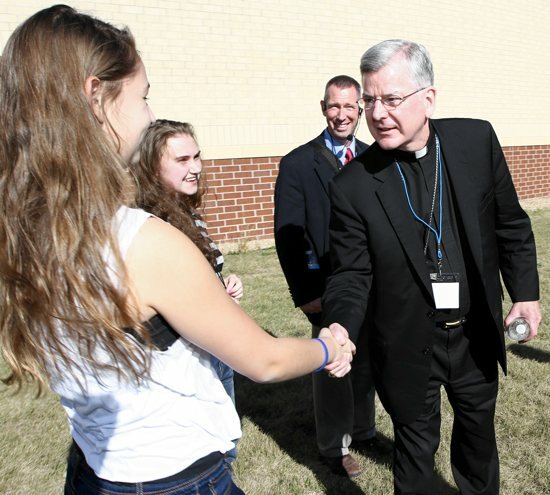 Ally Dudley, left, of St. Patrick in Oak Grove greets Archbishop John Nienstedt during Archdiocesan Youth Day Sept. 21 at Holy Family High School in Victoria. With her is Mady Banken, second from left, also of St. Patrick. Walking with the archbishop is Bill Dill of the Office of Marriage, Family and Life, which sponsored the event. This year’s theme, “Believe and Speak!” from St. Paul’s Second Letter to the Corinthians, served as the inspiration for the day’s events. Attendees enjoyed music performed by Sonar, Mass with the archbishop, opportunities for the sacrament of reconciliation and eucharistic adoration, and several Catholic speakers including Super Bowl champ Matt Birk via Skype, and Laura Sobiech, mother of Zach Sobiech, who wrote the hit song “Clouds” before dying from cancer last May. Keynoter Sean Forrest urged the youth to live out their faith in public and stay close to the Church and the sacraments. Becky Hess of Incarnation in Minneapolis prays during Mass. Like last year, event organizers created a Twitter hashtag (#ayd13) to generate real-time discussion of the day’s events. And youth were also encouraged to text questions to Archbishop Nienstedt for a question-and-answer session moderated by Father Erik Lundgren, associate priest at Divine Mercy in Faribault. Archbishop Nienstedt responded to questions ranging from his vocation, Pope Francis and sin to football, Halloween and being a bishop. Fellowship was the highlight of the event for many who attended. They said they enjoyed celebrating their faith with their peers and that the solidarity reassures them and gives them courage to live their faith daily. The schedule for this year’s AYD included a new element called the “Catholic Smorgasbord.” The 40-minute break between the afternoon and evening sessions offered attendees a buffet of activities including “Grill the Priest,” kickball, soccer, volleyball, small group discussions and a service project. Father Brian Park, assistant priest at St. Charles Borromeo in St. Anthony, skillfully-fielded questions from the youth. They didn’t give him any softballs either: Can you offer indulgences to help the souls in purgatory? How do we know God exists? How do we have discussions with irrational people? And, why does the God of the Old Testament seem so different from the God of the New Testament. Jack Laird and Archie Page from Nativity of Our Lord in St. Paul participated in the service project. They wrote personal letters to children who benefit from the Haiti180 mission — an initiative founded by Forrest to give Haitian children access to food, health care and educational resources. Both young men used their letters to share the message of God’s love. 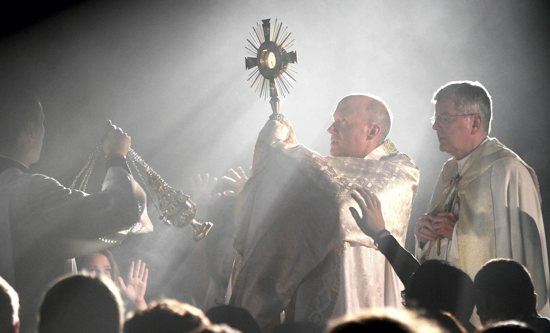 Franciscan Father David Pavonka of Steubenville, Ohio carries the Eucharist in a monstrance through the crowd, with Archbishop John Nienstedt accompanying him. More than 125 volunteers joined forces to make Archdiocesan Youth Day a success: seminarians guided cars into parking spaces, NET Ministry Teams welcomed attendees with cheering, dancing and high-fives, and other volunteers. One group of volunteers, the prayer team, will continue their work every day until next fall’s Archdiocesan Youth Day. “We pray for them before. We pray for them after. They’re in our hearts — always,” explained Debbie Biegler, prayer team leader. Despite their bright yellow shirts, the prayer team maintained a quiet, but strong presence. They participated in the events with the youth — always on the lookout for those who needed prayer, friendship or conversation. During adoration near the end of the event, as the monstrance containing the Eucharist was processed through the gym, prayer team members positioned themselves strategically among the youth. 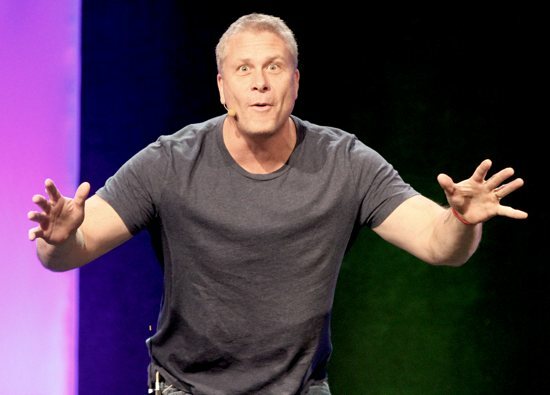 Featured speaker Sean Forrest pumps some energy into his presentation to the youth. Armed with pockets and fanny packs full of tissues, they watched the power of the Eucharist wash over the attendees. They gently offered tissues to many who were overcome with emotion. 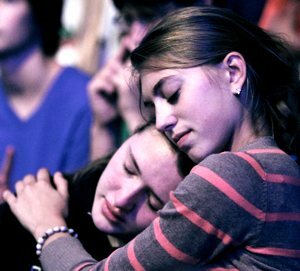 Prayer team members explained that being close to Jesus during adoration can stir many thoughts and feelings. “When Jesus enters the room, He moves your heart and your heart moves your emotions,” Biegler said. The event sponsors were also critical to the success of the celebration. Their financial support allowed the youth to attend this spiritual celebration free of charge. Cristy Goerdt, right, enjoys a quiet moment during eucharistic adoration with Mikayla Kelly. Both are from St. John the Baptist in Savage. This year’s presenting sponsor was the University of St. Thomas. Other sponsors were the St. Paul Seminary School of Divinity, St. John Vianney College Seminary, University of Mary, St. Catherine University, College of St. Benedict/St. John’s University and St. Mary’s University of Minnesota. Other partners for the day included TEC Twin Cities, NET Ministries, Partnership for Youth, St. George Catholic Books and Gifts, Benedictine College of Atchison, Kan., and EideCom Media & Events. The next Archdiocesan Youth Day 2014 will take place Oct. 25, 2014 at the University of St. Thomas.